Years ago when I worked on the Magnificent Mile, a colleague had a love for California Pizza Kitchen. It had become something of a palate cleanser for having too much pizza from Lou Malnati’s, Giordano’s, and other Chicago-style pizza eateries. For me, too much pizza, period, had made me lose interest in ever returning to any pizzeria, California Pizza Kitchen included. Imagine my surprise when I received an invitation for a review. My restaurant advisor, who had also worked with me in the Magnificent Mile, and I recently went to the location in Arlington Heights, Illinois, at 3 S. Evergreen Avenue. Not a considerable distance via commuter train, we arrived for dinner one evening after work. The restaurant was quite lively with families and friends. The front room service was top. While perusing the menu, we noticed that there was less focus on pizzas and the specialty pastas that our mutual colleague and we had indulged numerous times years past. Instead, there were appetizers and entrées that piqued our interests more than the usual fare that we remembered. Certainly thinking that it would be a better option to try something different, we told our server to make recommendations and send the dishes to the table. We did stipulate that we preferred to avoid pizza and pasta. As we waited, we imbibed some rather refreshing cocktails. I ordered a flight of sangrias ranging from a white plum to peach to red raspberry. 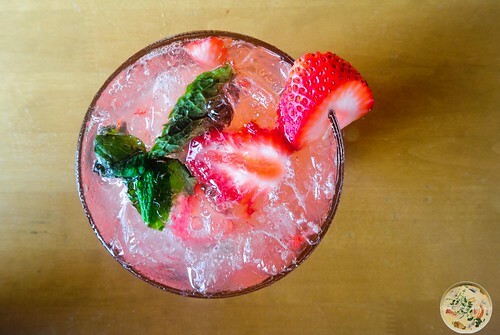 My restaurant advisor had a strawberry mojito. What we both noticed was that the cocktails did not have the watered recipe that one finds in drinks served at big box restaurants. These had the bracing snap of having been mixed by a mixologist. 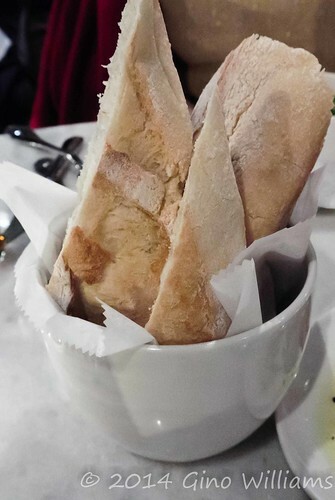 We had a mini complimentary loaf of bread with herbed olive oil. Basil Leaf Cafe, which is one of my favourite Italian restaurants in Chicago proper, preps their olive oil in the same manner. 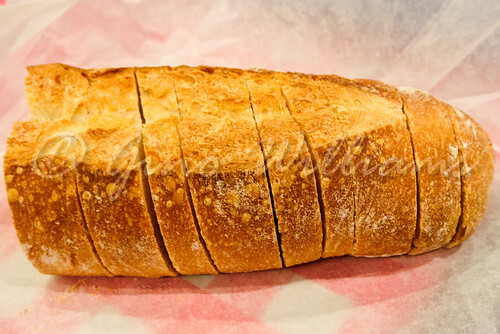 A huge plus with the bread being fresh, the complimentary feature was great. First to the table was a plate of tequeños. 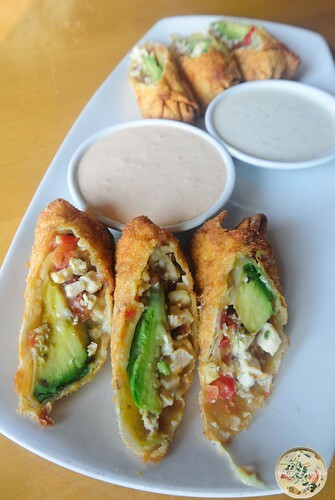 Very reminiscent of tequeños that I have had at a few Peruvian restaurants, the chicken and avocado in the ones at California Pizza Kitchen were mouth-watering. The added ingredient of bacon in the tequeños was unexpected. Then again, we didn’t order from the menu, but rather let our server handle the menu selections. Nevertheless, we were pleased. The first entrée was a plate of herbed roasted chicken with vegetables. It was by the second bite that we wondered why the restaurant had not been highlighting such delectable dishes more in the past. The chicken was not only tender, but it was incredibly juicy. Add to that well seasoned cauliflower, squash, and potatoes, this dish actually rivaled chicken dishes that I have eaten at some restaurants in Chicago that people rant and rave about as if the meat had been marinated in gold. The second entrée was the final determinant that California Pizza Kitchen had decided to take a different approach with its menu offerings. 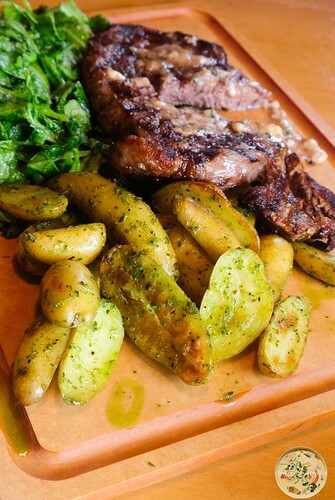 The rib eye steak topped with a light garlic paste had been cooked to a perfect medium well that left the meat succulent. The salad in a light vinaigrette and the fingerling potatoes that had been seasoned with touches of basil comprised a dish that my advisor and I agreed was better than some steak dinners we’ve had at a few noteworthy restaurants.We had not expected such a divine meal up to this point. Rather than order multiple desserts, we settled on a butter cake topped with a scoop of vanilla ice cream and garnished with whipped cream. As sated as we were from the complimentary bread, appetizer, and entrées, it still would have been a crime to have left any of the dessert. Although the cake was pedestrian in it’s presentation, it was anything but regular on the palate. With a cup of coffee each, we finalized the dessert and acknowledged that California Pizza Kitchen was a winner. 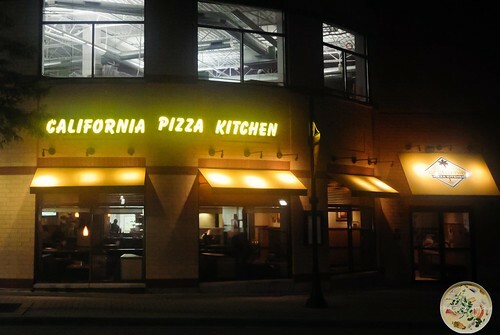 During a brief conversation with one of the staff members of the restaurant, there was mention that California Pizza Kitchen had started a move towards offering dishes that appeal to customers that preferred an expanded menu. It seemed that a certain age bracket preferred pizza and pasta, while an older age bracket had a taste for finer menu items. Without deviating from their core menu, the enhanced menu seems to have been influenced as a result of listening to their regular customer base. What they have done now was enriched their offerings for also enticing refined palates. When I lived in Hyde Park, several friends and I would block every Thursday to gather at any of the great restaurants in the neighbourhood. Given the multicultural environment in Hyde Park, there were restaurants representative accordingly. 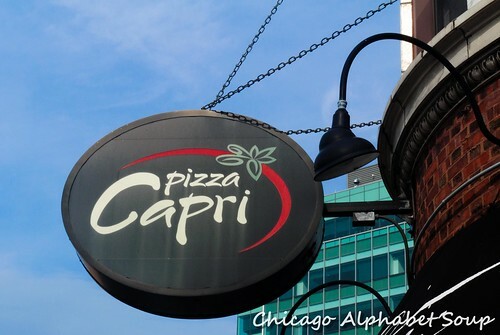 One of our favourites was Pizza Capri at 1501 E. 53rd Street. 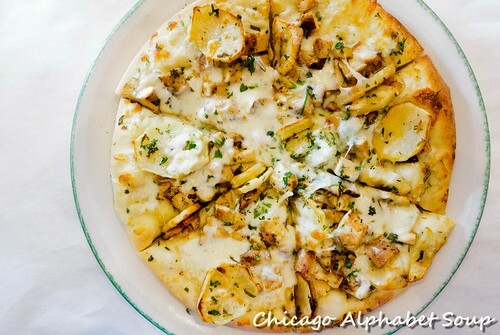 With so many Italian restaurants in Chicago having menus full of dishes with red sauces, Pizza Capri switched up a bit by adding cream sauces and other menu items that differ from the usual Italian restaurant fare. Fast forward to 2015 and I had a craving for something to feast on from Pizza Capri. 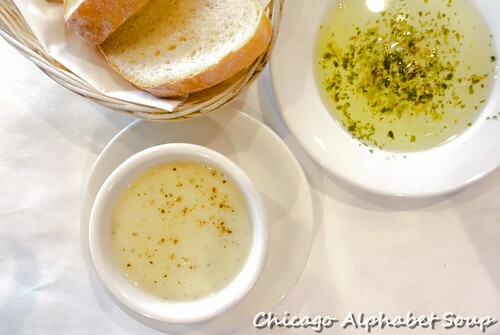 Opting to indulge a three course meal, I started with a cup of potato soup, along with the complimentary bread and olive oil accented with herbs. The potato soup popped with the flavour of potatoes and it was seasoned well enough that I didn’t miss any salt in the recipe. Instead of pasta, I ordered a small rosemary potato and chicken pizza. This was a complete deviation from a pizza with a tomato sauce, cheese, and toppings ranging from sausage, pepperoni, mushrooms, olives, and other ingredients. This pizza was simply divine. And with it being thin crust, it was hearty, but not to the point of me not being able to finish all of it. 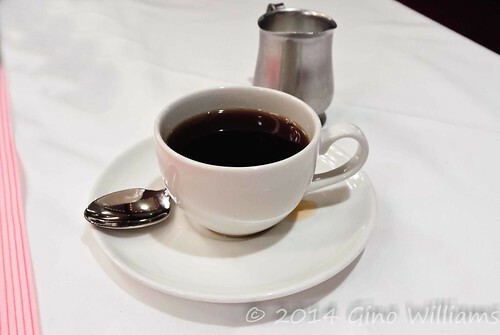 Knowing that I was going to have a finale of coffee and dessert, I waited for about 15-20 minutes before having a cappuccino and a flourless chocolate cake. Just like I remember from my days past, the cappuccino was brewed well enough that I could take it without any sweeteners. As to the flourless chocolate cake, it was addictive. With the consistency of a mousse, atop a crème anglaise, topped with strawberries, and drizzled with chocolate syrup, it was the perfect companion to the cappuccino. Since my first visit to Pizza Capri in the lat 90’s, the service and the high quality of the food have always been consistent. There are a few items on the menu that have classic red sauces and you can never fail by ordering any of the items. 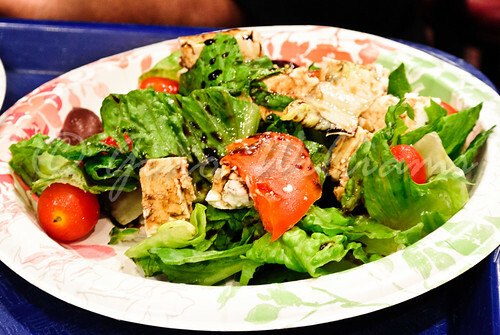 There are also specialty pizzas and other Italian dishes like alfredos and pasta in cream sauces that are also winners. But since my friends and I are now on different continents, whenever we have a reunion in Chicago, Pizza Capri is where we come together. Two years ago a friend had told me about a Greek restaurant in Oak Park, Illinois, named Papaspiro’s. I went. I ate. I made a calendar notice to return. And the restaurant was closed. I have to take responsibility for procrastinating and not returning immediately after my first meal. Needless to say, Papispiro’s moved across the street, as a new restaurant named Chara moved in to take its place. I am making a calendar entry to return to the new location in a few days and I won’t put off for later this time. 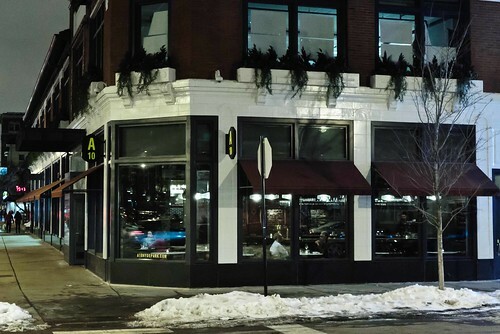 The new restaurant, Chara, is a welcomed surprise on the Oak Park landscape. 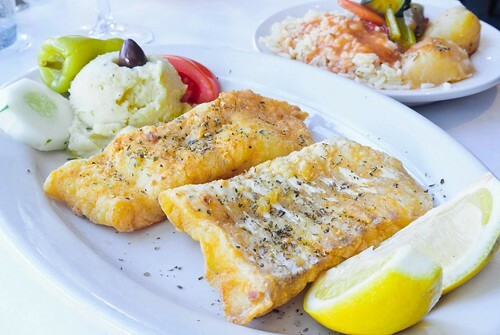 At 733 Lake Street, the restaurant boasts a large dining area, patio seating out front, and a menu full of authentic Greek delights. I arrived at Chara early to get a window seat so that I had enough natural light to photograph my dishes. With everyone taking advantage of the outdoor seating, I had an uninterrupted corner spot — until a couple came in and sat at the table immediately next to me. My sister, who joined me around the time I was indulging dessert, can attest to that. 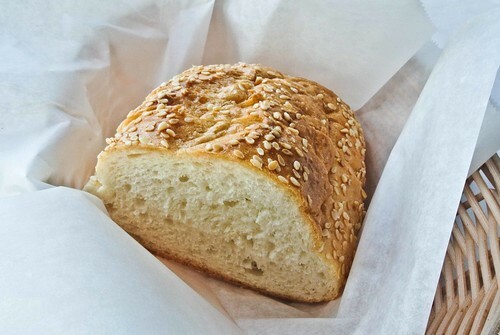 In addition to the homemade, complimentary sesame seed bread, I started with a melitzanosalata. This spread of smoked eggplant, potatoes, garlic, and olive oil served with a black olive, slice of tomato, and slice of cucumber was a fantastic appetizer. 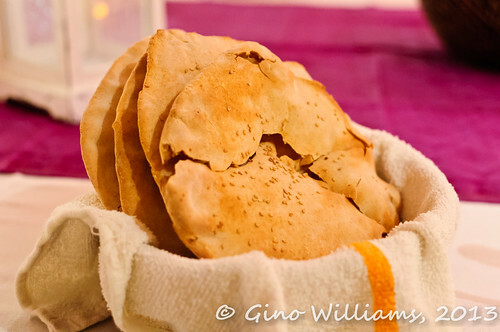 Along with the melitzanosalata came pita slices that I used to scoop and devour the dip. The melitzanosalata is the kind of spread that I would serve at parties instead of the usual dips many purchase for gatherings. For my second course, I ordered shrimp saganaki with feta. 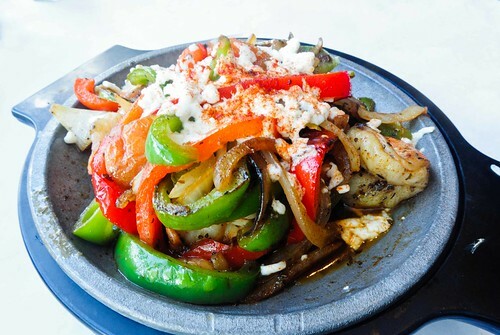 Plump shrimp served with roasted bell peppers and onions, and topped with feta, I was all done with it before I realized that it was not the same as regular saganaki — the cheese that is brought to the table and set aflame. Although the shrimp saganaki with feta was more like a salad, the portion was enough to be an entrée. Because I was hankering for some seafood, I was quite happy to find bakalo on the menu. The pan-fried cod was mild in flavouring and the seasoning was faint. However, there was still enough pop in each forkful to make the dish appetizing. And not having a fishy taste to the cod made it that more enjoyable. Adding to that the side of skordalia and the rice pilaf covered in a tomato based gravy made this my favourite Greek entrée. The mashed potatoes of the skordalia was actually a nice spread for the fish. But the rice pilaf with potatoes, carrots, and zucchini balanced out the mildness in the cod. With the seafood dish, I wanted a glass of wine. 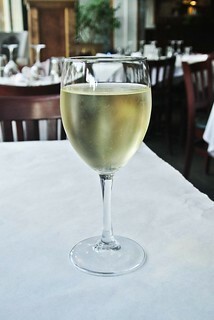 I had told my server that I wanted a white wine, which is fitting with seafood and poultry, and he mentioned that he would bring a nice wine for me. 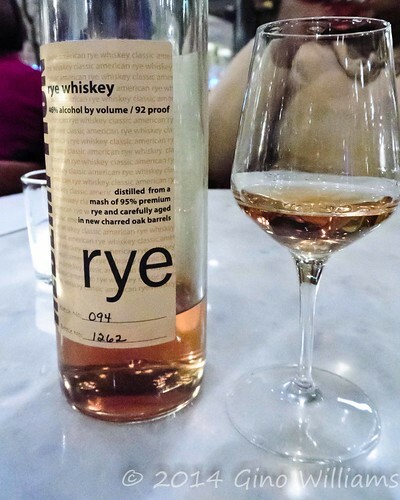 I had not given any specifics (e.g., a dry white wine or a sweeter white wine) and I was thoroughly satisfied after my first sip. 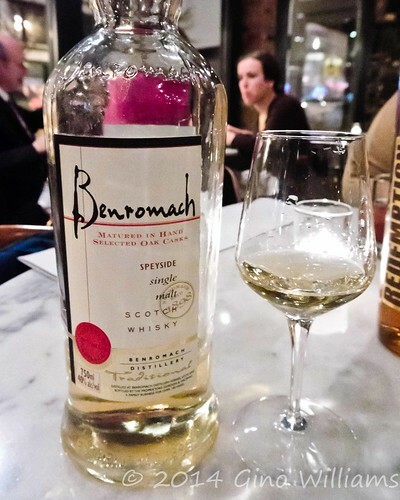 There was a combination of fruity highlights and floral notes. 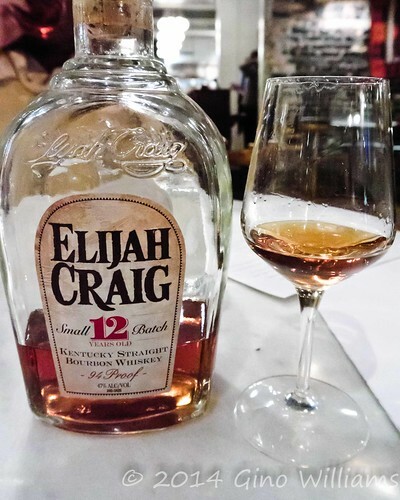 As I am sure that there could have been any selection of wines to accompany the cod, the glass of nectar that I had simply could not be surpassed with any other choice. By the time I had finished my entrée, my sister had sent a text message to me to say that she was nearby. So, I waited and let my food settle some. Once she arrived and ordered, I opted for a dessert. There was baklava on the menu and having had that to excess as of late, I inquired about a certain Greek dessert that I think would be a sin to miss having at a Greek restaurant. I was curious as to whether there was galaktoboureko on the menu. 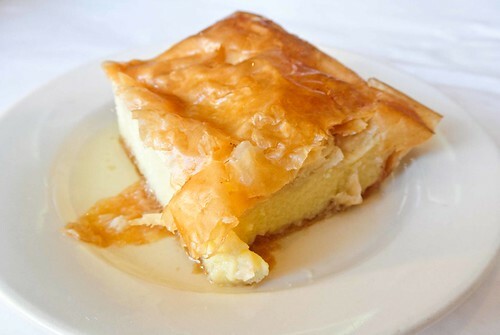 To me, galaktoboureko is truly a slice of heaven, not just custard with a phyllo crust drizzled with a honey glaze. I enjoyed it very, very slowly along with a pot of peppermint tea. With change, there is not always the guarantee of improvement. I only had one dining experience at Chara’s predecessor, Papaspiro’s, so I never got the opportunity to develop an attachment to the restaurant. I will admit that after only this one meal at Chara, I have developed an attachment to their fare. Part of it was the friendly service, which actually sets the tone for how great one will enjoy a meal. It also helped that the food was superbly appetizing. It was a package that I could not deny spiked my appetite. And if I were of lesser scruples, I would have stood at the end of my experience, grabbed a plate, smashed it against the floor and yelled, Opa!!!!! Shortly after I joined a company in the West Loop, my colleagues wanted to go to a nearby Indian restaurant. Let me just say that I love Indian food. So, I put my antisocial disposition aside — actually, I’m only antisocial until I’m not longer working with someone — and I joined the troop for lunch. Buffet and mild for the American palates that flooded the restaurant. Slow clap, twice. Well, one thing I have noticed about many of the Indian restaurants very close to the Chicago Loop is that the buffets are indeed for quick bites and incredibly mild. No Indian restaurant should serve its food mild. It MUST come to the table spicy. And I learned later that going back to any of those restaurants for dinner is when you get to see that they can shine with food so full of flavour that you continue to return. 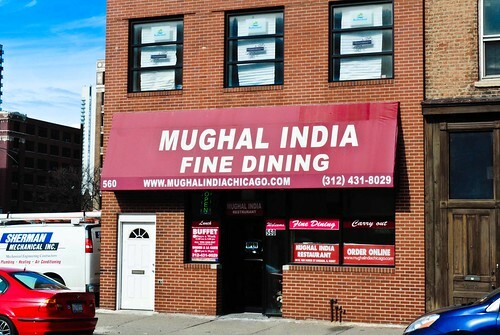 Well, I returned to Mughal India Restaurant at 560 W. Van Buren Street for some non-work day delight. I had gone back recently for take-away. When I got home and started gobbling my purchases, I knew I had to return for a proper blog. I also made a note to myself that I was not going to indulge any more Indian buffets in the downtown area. It is necessary to go away from The Loop to get authenticity in my Indian buffets. Now, I’m not a stickler for decor since I’m more concerned about flavour than I am about whether the cushions are plush as opposed to crushed velvet. A few whiffs of the air and I was ready to work my fork on some curry dish. Because Indian food can be heavy, I skipped having an appetizer and decided that I would have two entrée selections. I ordered jeera aloo and fish tikka masala with basmati rice and poori. Ordering the entrées spicy made the dishes that more appetizing. 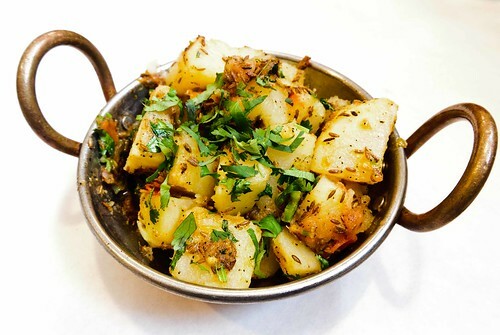 The jeera aloo was bursting with whole cumin seeds and other various spices — no bland potatoes for me. This was what I considered my “dry” dish since it was not in a gravy. The spices compensated for the absence of sauce. The fish tikka masala was incredible. 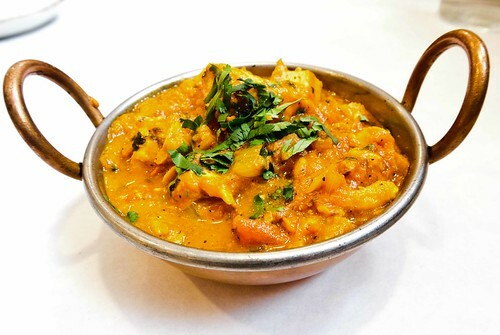 Boneless fish marinated in yogurt and spices, and then served in a spicy masala gravy. If I was not a seafood lover already, I would have been after indulging this entrée. 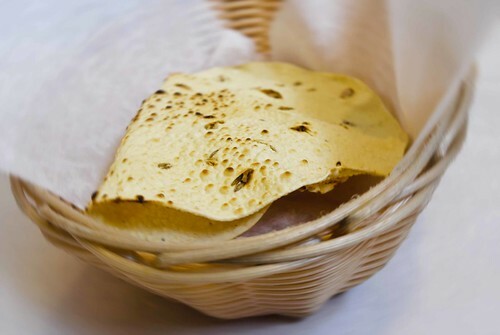 The rice was good for taming the flame of the spices and the poori, which is my favourite Indian bread along with bhatura, was my eating utensil. 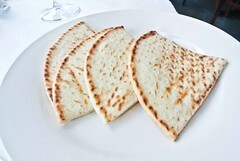 Yes, I eat Indian food using bread for my utensils, which may explain why my hands have an everlasting curry smell to them. After I had finished the meal, the server did not rush me. So, I took a little time to let the food digest before requesting a masala chai. The beauty of having a masala chai at an Indian restaurant is that you are guaranteed not to have them serve you that concoction from a carton that is all the rage at coffee houses. What murder. What horror. What crime. Oh, and if the masala chai is really good, you won’t require any sweeteners. Such was the case with the masala chai at Mughal India. 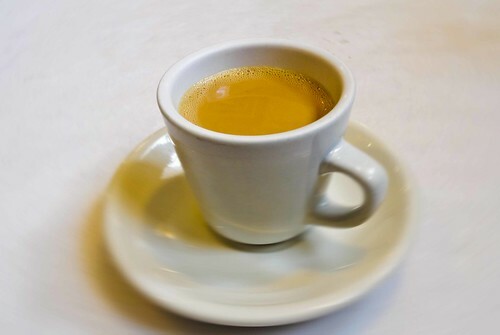 For all those international coffee commercials that used to come on with the women taking a sip and whimsically imagining all being good and well in the land, imagine someone smacking their cups from their hands and offering them some masala chai. Those women would skyrocket straight to the stars. Now, I can’t say that I will ever return to Mughal India Restaurant for their lunch buffet. They raised the bar with their dinner and Saturday lunches. Oh, let me not forget this. My in-house dining bonanza was on a Saturday afternoon and they served from the menu only. Let’s just say that they curried favour with me in a way that has moved them high up on my list of recommended Indian restaurants. Considering I get to see the Indians in the open kitchen preparing love for the plates, it is authentic in a major way. Mughal India Restaurant will be one of the main reasons why my pores, according to my highschool sweetheart, seems to exhale curry. And I smile. February is speeding with a quickness. And I had thought that I would have visited at least one restaurant per week since the New Year began. Alas, the constant snowing and arctic temperatures when snow isn’t falling joined forces to have me running to the warmth of my condominium rather than to the inviting flavours of any restaurants. That is not a good thing because it means once the temperatures warm up finally and I go outside to venture to restaurants for sampling, I will overdo it and then have issues with the night elves that visit my closet and stitch up my pants such that they’re tight around the belly. Ugh, I hate winter, but I love food enough to brave the chill of the Chicago air every once in a while. A great friend and I had managed to escape to Hyde Park a few weeks ago to sample a new restaurant on the Hyde Park landscape. 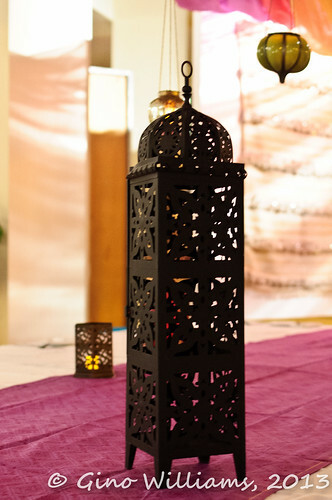 We were so blown over by the service and the food that the experience had plagued our thoughts and conversations since. After a long weekend of being inside, I had cabin fever. I am not a fan of shopping and long walks along the beach with the wind blowing angrily off of Lake Michigan may be a romantic escape for those who like to play roulette with pneumonia. But food is my lover and I can stand a walk to the subway and connect to a bus to get to a destination that will take my mind way from the fact that the temperatures never got out of the single digits. So, after making reservations, we went back to A10 at 1462 E. 53rd Street in the new chi-chi fantasy world that has taken over the corner of 53rd Street and Lake Park. 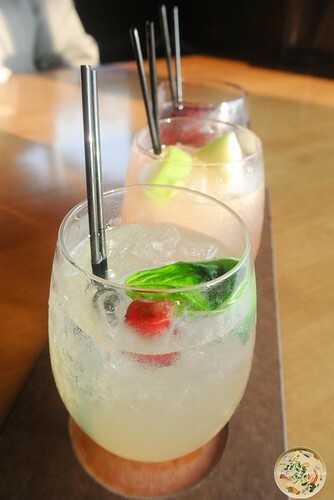 There is always the request for what one would like to start with drinking. My friend tried her hand with an old-fashioned whiskey cocktail since I had it on the first visit and apparently wouldn’t shut up about how much I loved it. After her first few sips, she had kept mentioning how it was an excellent option. I was in a rare mood — no rarer than usual, though. I requested a flight of whiskies. 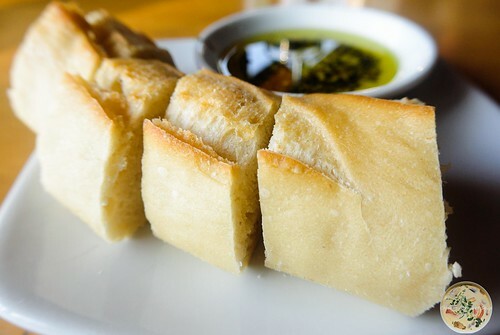 You can hear all the beer connoisseurs mumbling through upturned sneers, “Snob.” With a baguette in front of us served with a plate of olive oil and balsamic with garlic cooked such that it was spreadable, we were off to a smashing start. For starters, my friend had a bowl of roasted garlic soup and I had a Portobello mushroom pizza. The soup was hearty and full of flavour. I recommend it highly if you are all about being heart healthy. Even if you are one of those fans of vampire movies and you fear one of the pretty actors with polished fangs may come to you one night to bite your neck, a bowl of that soup would be perfect for fending off those wicked vampires. 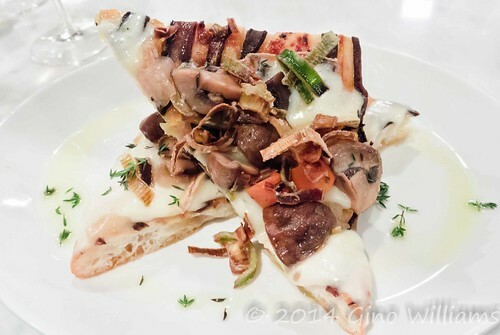 The Portobello mushroom pizza was more like grilled toast with cheese, sautéed onions, and pickled carrots. Giordano’s what? Eduardo’s what? Lou Malnati’s what? Domino’s what? Pizza Hut what? The Portobello mushroom pizza was a blast. My taste buds had me in a mood for seafood. Fortunately, A10 doesn’t disappoint when it comes to seafood offerings for my palate. I ordered a cold smoked trout that was served over whipped garlic potatoes. Wow! Having had trout fried, having it smoked such that the fish was flaky and meaty has now moved it up into my Top 5 Fish Loves. Because it was all so fantastic, I worked my knife and fork in slow motion, trying to make the moment last as long as possible without letting the dish get cold. We sat for a while after we wrapped up our entrées, reminiscing about how Hyde Park used to look. It appears that change is taking over the landscape of Hyde Park in a rapid fashion that would otherwise eradicate charm in other neighbourhoods because of poor execution. However, Hyde Park has been a bastion of diversity and change, so the new look doesn’t feel out-of-place. By the time my friend’s coffee and my cappuccino arrived, we had recounted where old establishments were that have gone away to give way to a shinier, dynamic Hyde Park. 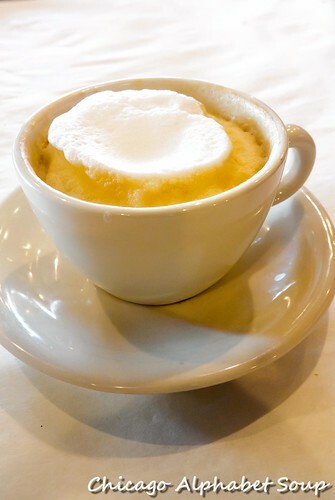 In addition to our coffees, there is one dessert we had that I think that everyone in the Chicago metropolitan area, as well as visitors to the Chicago area, must try. It’s soft serve ice cream — and I don’t mean that cold foam you get at McDonald’s. 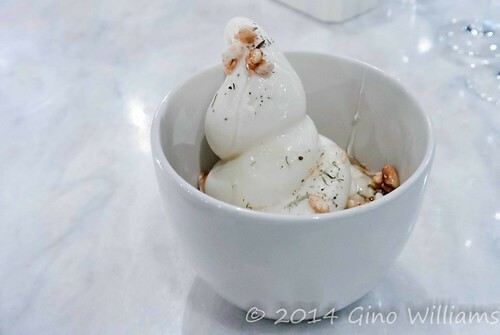 It’s homemade ice cream, but accentuated with almond granola, a honey drizzle, and thyme. 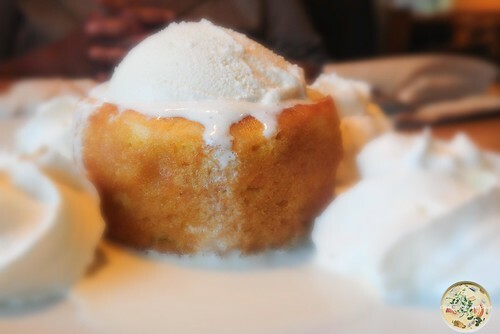 I have prepared my share of savoury ice cream, so this dessert was clearly a winner to me. This was my guilty pleasure dessert in advance of my birthday. I had an allowance for something sweet, yet not sugary and definitely not saccharine. It would be a lie for me to say that I was not in love after the very first scoop. For those of you reading this, I hope that you are at home or at some location where the temperatures are not as hateful as the temperatures in Chicago. As much as 2014 promised to be a good year, the Arctic temperatures have been prohibitive for going outside. By now, I would have gone to at least four restaurants and blogged them, but by the time I pack up to leave work during the week, my focus is on going home to get into my sweats and fuzzy bear claws. Yes, I have a pair of those. And the weekends seem to be candidates for sub-zero temperatures and mini blizzards. However, I simply cannot sit inside all the time. During one of my “escape from the cabin” moments, I went to a nearby coffeehouse to edit some photos. After a few hours of productivity, I received a text from a great friend who asked if I was interested in partaking of Chicago’s Restaurant Week at one of my favourite seafood restaurants. Well, with food being a factor, my text response was YES — I typed it in all caps. Knowing that there would be a crowd the closer it got to 7:00 PM, we made reservations for 5:15 at Shaw’s Crab House at 21 E. Hubbard Street in the River North section of downtown. 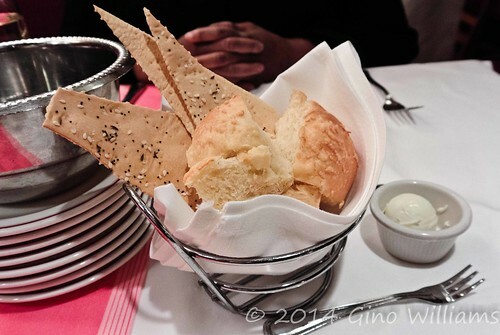 While perusing the menu for any ala carte options, we gnashed away on cheddar rolls and wafers. Um, um, good. Sure, this comes complimentary with the meal, but is still worth mentioning because the bread must be baked on the premises. You cannot find cheddar rolls like these in the market in the bakery section, on the aisles with aging loaves of bread, or in the frozen food section. Our server gave use a grand explanation of the restaurant week menu. 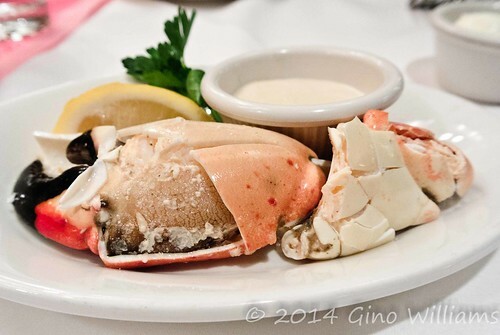 Let’s just say that Shaw’s Crab House knows how to lure its customers back for repeat visits. 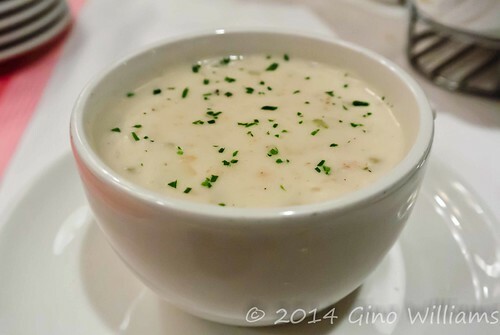 There was clam chowder for the soup. 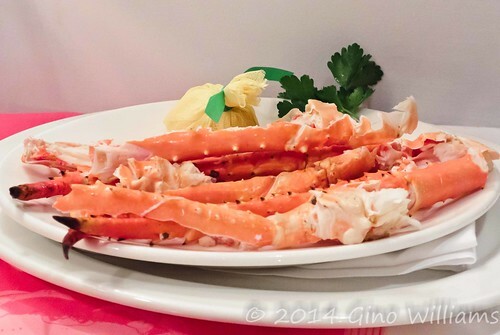 For the entrées, the choices were king crab legs and Maine lobster. Dessert options were key lime pie, which you can never go wrong with, and a raspberry walnut cobbler. Far be it from us to be dining prudes, we ordered a dungeness crab claw for an appetizer. We also added potatoes au gratin and creamed spinach to our entrée orders. The crab claw came to the table pre-cracked. It would have been a chore, quite possibly with things flying about the table. The claw was full of meat, bursting with flavour. Now, granted it wasn’t a substantial appetizer, it was certainly worth the order. For when the clam chowder arrived at the table, it was evident that the remainder of the evening would be based on complete culinary satisfaction. 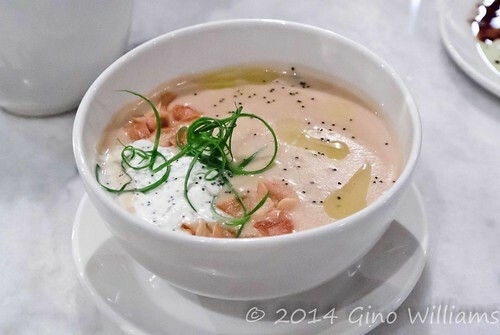 Thank God for restaurants that don’t feel the need to accentuate clam chowder with pork. There must have been complaints from some pork eaters about a few seafood restaurants that left the oink factor out of their clam chowder recipe because, sure enough, it shows up in the bowl at some eateries. Shaw’s Crab House has not fallen victim to that recipe blackmail. The entrées were divine. The crab legs were full of meat. With melted butter for dipping, that was all we needed to forget that the temperatures in Chicago were in the single digits. It was all about concentrating on cracking the legs, digging out the succulent meat, and devouring it like seafood lovers. 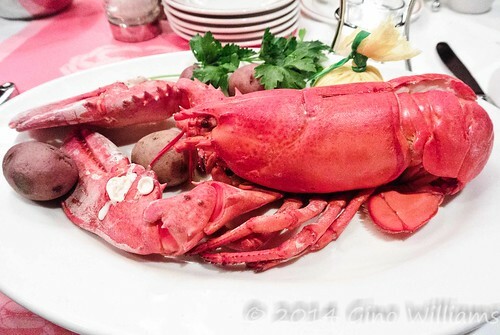 The Maine lobster came to the table steamed. Each bite exploded. No tough texture, no unsavoury aftertaste, only bliss. And not being one to let lobster go to waste, when I got to the head, there was a voice in my head that screamed, FINISH HIM!!! I complied. The mushy texture from the head is not something that appeals to a lot of people. It’s a bit reminiscent of marrow, for those of you who have chewed chicken bones to splinters and partaken of the tasty insides of the bones. It may be better used to season some soups or other recipes. For me, if I paid for it, it’s good as gone — unless I become so bitter that I feel the need to throw the plate against the wall. The potatoes au gratin were delicious beyond words. They did not come from a Betty Crocker box. 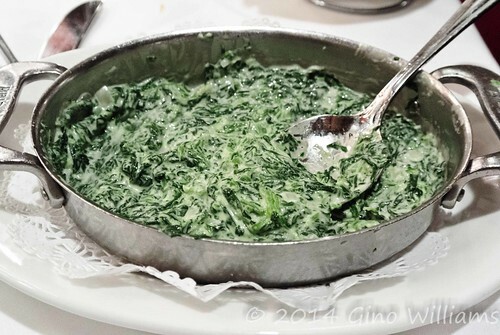 And the creamed spinach reminded me of the spinach artichoke dip that a restaurant named Houston’s used to prepare — before that restaurant closed permanently for business. As part of the Restaurant Week menu option for desserts, there were key lime pie and raspberry walnut cobbler. My main New Year’s Absolution was to remove desserts from my diet except for my birthday. So far I have been faithful, with the exception of having a panna cotta at one restaurant. My nutritionist and doctor said that I could indulge sorbet, fruit, and light cream desserts. To keep from possibly getting out of hand, I passed on the dessert and let my great friend take mine home with her. So, she had the pie and the cobbler. I settled on coffee laced with Bailey’s Irish creme. My friend had a regular coffee with cream. Talk about a great wrap-up to a fantastic meal. For years I had gone to Shaw’s during lunch when I worked about two blocks way from the restaurant. Even when I changed jobs, I was always confident that my palate would find satisfaction in all that the menu had to offer. 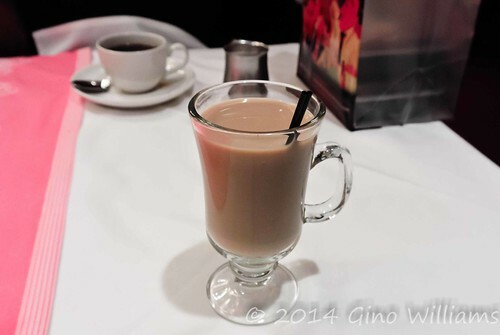 Because Shaw’s is not ethnic, per se, I never blogged it. This time I felt that it was worthy of inclusion on Chicago Alphabet Soup. Now that I am being more serious about sticking to a strict seafood and vegetarian diet, there may be more seafood restaurants showing up on the blog. The service at Shaw’s Crab House was way past outstanding. Any time a server takes time to explain things in a great detail and offer recommendations without a scowl or a need to rush away from the table, the experience is usually a hit thereafter. Not once have I had a meal that I was not pleased with and the most recent dining experience was such a highlight that I was talking to my food and singing. And looking back on all of this, going out in the cold wasn’t such a bad idea. I got my usual food bonanza in the process. December has arrived and it is during this time that I always ponder whether there was something I had intended to do between January and the end of November, but somehow never got around to doing. I swear time went slower when I was a kid. The summers dragged on forever — and I didn’t complain. Christmas break felt like a whole month. School was the equivalent of endless punishment. Fast forward to age 45 and each year feels compressed from a full twelve months to about seven. However, I still get to partake of my favourite hobby second to photography: eating. And for the end of 2013, I decided that I would do something different — a list of Top 10 Jaunts for 2013. 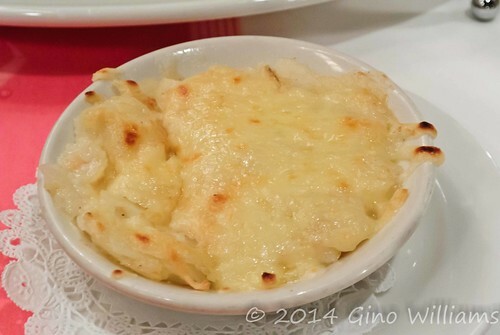 So, this post will be dedicated to the restaurant discoveries that tempted my palate. 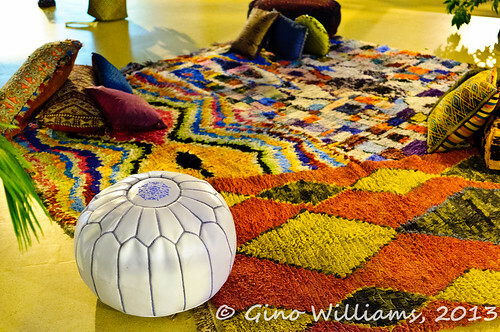 Since I have already written extensive blog postings for each, I will only present highlights. I had spent a lot of time in the Edgewater neighbourhood during the summer. My favourite Indian restaurant is there. One day while walking down Broadway, I happened to see a building full of Chicago architecture with a menu in the window. Having passed the building many times, it looked too fancy to register as a restaurant, but I was glad to have been in a casual mood the one Saturday I stopped and took notice of it. The food was outstanding and the service was top. From the interior, one can easily get the sensation of being in Europe, but it’s the Vietnamese influence in the food that pops. With the menu items supposedly having a French and Vietnamese fusion, I didn’t detect a heavier French accent. It was the Vietnamese flavours that stood out more. In the future I shall return for more good food and great service, and hopefully see if there is more balance to the menu. A great friend had sent a text message to me to prompt me about Freddy’s while I was at an Italian restaurant on the Far North Side. She had already enlightened me to a few cafes and restaurants in Berwyn, so I trusted her recommendation. 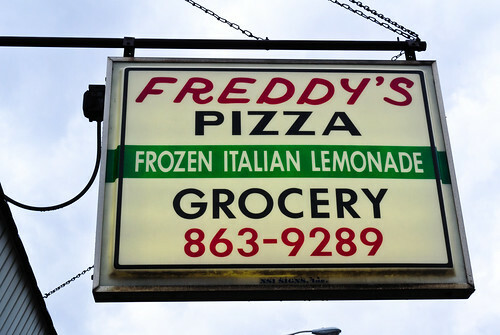 She gave me the formal introduction to Freddy’s Pizzeria and Grocery. This is a small grocery store with an annex built on to the side of the market for those who wish to sit and eat without having to rush home to devour the food. 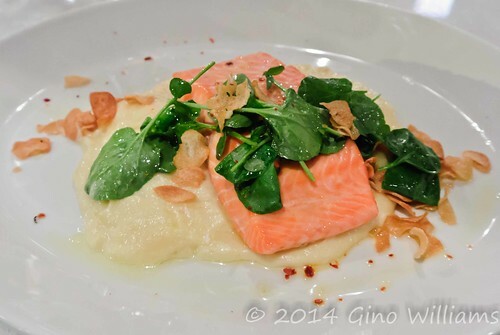 There is authenticity to every dish that puts a lot of big box Italian restaurants to shame. It’s evident when you enter the door and see the long line that stretches from the door, to the back of the grocery store, all along the counter, and up to the cash register. I think the trip out to Cicero is worth it, but I advise you to be prepared because staring at the selection of delicious food behind the counter may throw you into a food frenzy. Grub Hub is a beautiful thing and a glorious thing during the winter when delivery is a viable option. I had tried Silom 12 numerous times as a take-away choice when I was too lazy to operate my own stove. Not once was I dissatisfied with what I had ordered. Well, while I was having my hallway bathroom remodelled this summer, I needed a moment to escape from the sound of drills, saws, and banging. Where should I find myself but at Silom 12 for a proper sit-down. And oh was I pleased beyond words. Logan Square is one of America’s hottest neighbourhoods and with the addition of restaurants like Silom 12, it’s easy to understand why. One would think that the price per dish may make the cha-ching sound. No, the price, service, and food make a harmonious sigh of satisfaction. Well, let me take that back and make it personal. I made a harmonious sigh of satisfaction with each bite of food I took and believe me when I say that I ate a lot. When I first moved to Chicago, I spent a little over a year in Northbrook. There was only so much that I could take of the sound of crickets. New York City had spoiled me. So I moved into Chicago proper and my first Chicago apartment was in Rogers Park. At that time Rogers Park had a heavy Mexican influence. Fast forward to 2013 and there seems to be more diversity gracing the Rogers Park landscape. One addition to the neighbourhood is Masouleh. I had met up with some friends after work one Friday evening and had fallen in love with the place after only having some herbs, cheese, and radish put on the table. It was authentic and when I say authentic I mean the flavours popped the way I remember Iranian food tasting. I don’t mean plain hummus and pita bread either. I had to return for my very own adventure and by the time I had finished a parfait glass of Persian ice cream, I was typing my initial blog post from the moon. 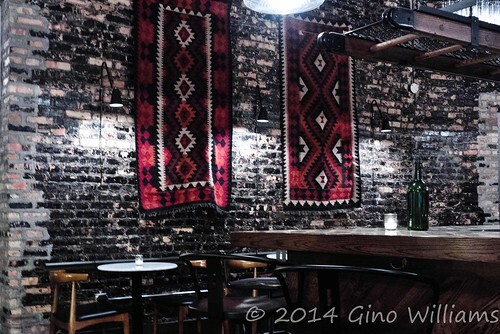 The first restaurant I went to when I started Chicago Alphabet Soup was Kabul House. It was at a different address. Months had passed and then a few years went by. When I had made plans to return, it was closed. Then there was a cloud of sadness because I remembered the food being so delicious. My friend and I were at the restaurant for hours, slowly taking care of the fine dining that came from the kitchen. Well, I was informed that Kabul House had opened at a new location. I had added it to my list and during Memorial Day, I was so glad that I went. Let’s just say that I rolled my eyes and I don’t mean as in disgust or to be cheeky. Oh, off with the person’s head who said that it’s never as good as the first time. It was better the second time around. If anyone ever starts rattling off the old adage that the best meal of the day is breakfast, tell them to put a footnote on that and immediately rush to Pannenkoeken Cafe. I am not one for eating lunch or dinner delights from Germany because they are heavy on the stomach. Not quite as sleep-inducing as Eastern European food, but you will drag afterwards. A German breakfast, on the other hand, causes the angels to sing. Pannenkoeken Cafe is a small cafe, so getting there early is advisable. Now, although the breakfast isn’t heavy on the belly, it is filling. So, you have to go on several visits. You have to. You must! Don’t even think about The Original Pancake House. Make your own pancakes at home, but go to Pannenkoeken Cafe for a proper breakfast that will give you a perpetual smile. Rogers Park has developed a bit of magnetism to it thanks to the addition of a few ethnic eateries. There are several Ethiopian restaurants in Edgewater. While going to Masouleh one evening, my great friend who had recommended Freddy’s to me pointed Den Den Eritrean Restaurant out to me. I don’t think I had taken a few steps before I retrieved my smart phone and blocked some time for a visit. I had never thought of any Eritrean representation in Chicago’s culinary landscape. Everything about Den Den was top-notch. While I can’t say that Eritrean and Ethiopian are the same, the food preparation, serving, and method of eating the food are the same. However, Den Den takes the top spot among the Ethiopian restaurants I’ve been to in Chicago. And I’ve been to all — except one that I zipped pass while speeding up Ashland Avenue. Skokie has a small section in a business district that isn’t on a busy street. Had I not gone to Kabul House to renew my food vows, I never would have stumbled across a restaurant that has some cultural significance to me. When I saw the word “Jamaican” flash in front of my eyes, the return to the small stretch of Oakton Avenue was mandatory. The saltfish and ackee, callalou, rice and beans, beef patty, and june plum juice reminded me so much of my paternal grandmother’s kitchen that I spent almost every Saturday at De-Jred Fine Jamaican Cuisine. And when I didn’t get back during a Saturday visit, there were occasional trips for take-away throughout the week. Certainly when you find something with a cultural attachment, it’s hard to detach. Earlier in the year, I wanted to try something new in the downtown vicinity. Most restaurants in downtown fall into the tourist trap or “big box” categories. You go and then tell your friends that you had gone to such-and-such restaurant because that’s where all of the Joneses had gone before you. But Roka Akor is where you go when you want to keep up with the Williamses. I was blown away on the first visit with the good fortune of having a server who had hit the mark on every menu choice offered as an option. There wasn’t one dish to be placed in front of me that I wasn’t raving about by the second bite. Getting to sit at the robata grill was a splendid option because I got to chat with the sous chef and the sashimi chef. You can’t do that at just any restaurant, and certainly not at a tourist trap or “big box” eatery. Coming up with the number one spot was hard — and I’m not saying that just to have something to say. I started the year off with Basil Leaf Cafe being the first ethnic restaurant I was sampling. This was also the first time that I had decided to have a degustation without ordering from the menu. I trusted my server to make all recommendations and bring to the table a soup, a salad, two entrées, and a dessert. Basil Leaf Cafe had raised the bar up through the clouds and even on return visits, I was always in awe of how I could simply state that I liked seafood and vegetarian dishes, hand the menu back to the server, and let him or her bring to the table culinary choices that had indicated that they apparently listen to their dining patrons. I don’t know where to begin with Yuzu. This was another hard decision because I wanted there to be ten restaurants on my Top 10 list. It turned out to be eleven because Basil Leaf Cafe and Yuzu Sushi and Robata Grill were deserving of the top position. My first visit to Yuzu had moved the expectation bar way up. 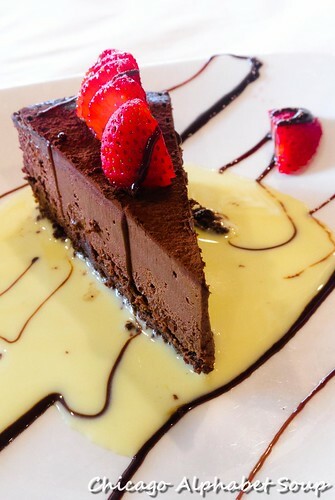 No one disappears behind a door and comes back with a delectable dish. The sushi station and the robata grill are on full display, so you know exactly what you are getting. I was curious as to how a sushi bar could have a constant flow of patrons early in the day on a summer Saturday. It was after the first bite of some grilled eggplant from the robata grill that I understood why. Based on all of the robata grill items and sushi that my server had brought to the table, I honestly believe I could have won the lottery if I had asked her for the winning numbers. Everything was delicious. I am hoping that 2014 will not be as busy and fast as 2013 has been. Yes, there is the saying that you should take time to smell the roses. But when there is the aroma of some inviting food wafting from the kitchen, put those roses in a vase and go see what the source of the aroma is. I know that I shall do just that in the New Year. I have to come up with ten more new restaurants for 2014. That means weight gain. Oh wait, no, that means I had better get started coming up with a list of eateries to sample throughout 2014. And at this time, I would like to thank all who have been following Chicago Alphabet Soup and who have been giving me encouragement. Enjoy the holiday and may the New Year bring you joy and continued peace. And if none of that, then may some server bring you a dish that makes you sing a happy song. Recently, while making some updates to Chicago Alphabet Soup, I crossed one of my earlier write-ups, one that I had done on a Moroccan restaurant named Andalous. It has since closed and not to sound gloomy in an exaggerated fashion, there was a pang of disappointment in the discovery. Andalous was the only Moroccan restaurant that I had found in Chicago — and I am sure there are many more since the first outing to the restaurant — but the food was outstanding and considering the owner took time out to explain a lot dishes to my friend and me, I was sold on the restaurant being a top recommendation to those near and who would visit from afar. 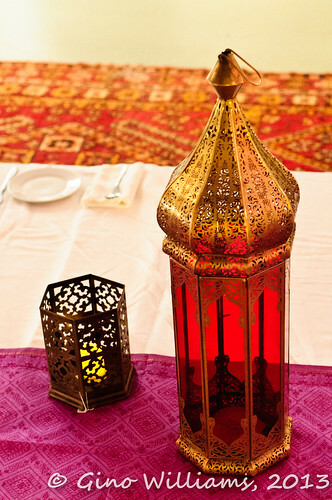 I had visited Rabat, Marrakech, and Agadir, so I had a point of reference for authenticity for the dishes. 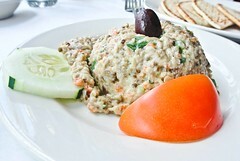 Andalous did not disappoint on the first visit, but it’s closing was a shock. So after continuing to refine posts on Chicago Alphabet Soup and reminiscing about Andalous, there arrived an email invitation in my inbox. 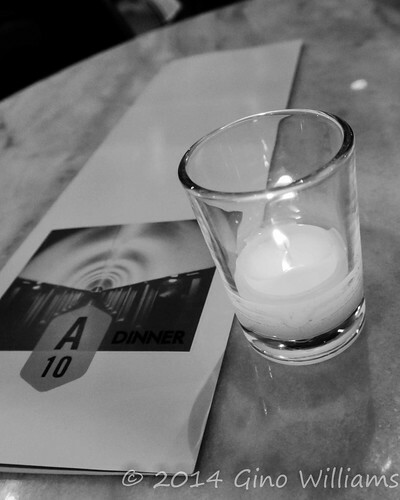 It was for a dinner at the Hairpin Arts Centre at 2800 N. Milwaukee Avenue. Having lived in Logan Square since late 1995, I was not aware of any art centres in the area. Then again, work had required a lot of travel, which kept me jetting across the skies, across the oceans, and to destinations fun and exciting. Even when in Chicago, I was constantly in motion meeting with friends, dining at various restaurants, and relaxing so that I was not living my life in one day. Other than my condo and a few watering holes, I never paid much attention to any other locations in the neighbourhood. I figured the invitation would give me the opportunity to see the arts centre and indulge one of my favourite engagements — eating. This was indeed a traditional affair. Christopher Turner, a butcher at The Butcher & Larder at 1026 N Milwaukee Avenue, was the chef. In true Moroccan form, we had to remove our shoes. The invitation had been extended to a fair amount of individuals, so there was a long table that we all sat around on pillows on the floor. I thought to myself that this was going to be a good evening. 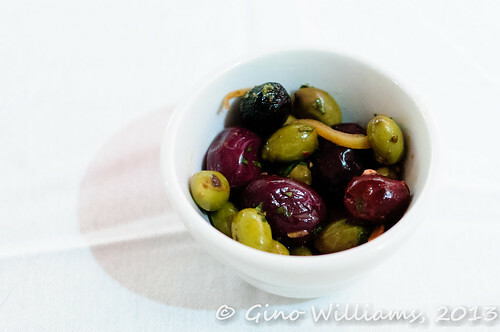 For starters, there were black and green olives that clearly did not come from a jar. There was also homemade hummus, quite noticeable with a bit of grit to the texture, a sure indication that it was not procured pre-made. 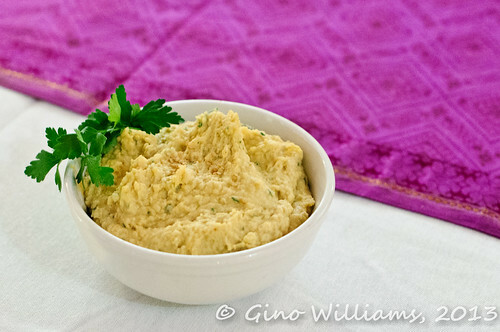 With khobz, or Moroccan flatbread, the hummus was an appetizing highlight. Because the lighting was relatively dim and we had to pass dishes in communal fashion, there were a few dishes that I did not get to capture any visual impressions of. There were carrots that had been prepared with spices and everyone devoured them to completion. There was also what is quickly becoming a favourite vegetable of mine, as well as the source for my red velvet cakes turning out properly red and moist — beets. Many times I have joked about how my grandmother’s spirit is rolling her eyes and declaring, “Now that boy decides that he loves beets.” I had been engaged in conversation with the individuals seated near me, so I had missed the explanation of how the carrots and beets were prepared. I will simply say that rabbit food prepared Moroccan style is not a bad thing. 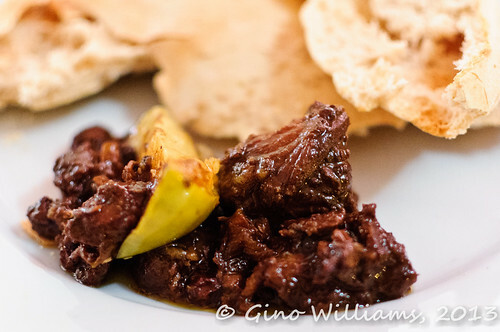 The first meat dish to come to the table was a beef tangine. I have been quite good with keeping seafood as the only meat in my diet, with a few occasions of falling off the wagon and sampling chicken or beef. With my decision to become a pescatarian being a personal decision, not religious or because of a detriment to my health or fad, I opted for a scoop of the beef tangine with baked apples. One, I am glad the beef was not tough. I used the kobhz to pick up the meat and noticed how tender it was to the touch. It was succulent to the bite. Second, the seasoning of cloves and cinnamon made it that more tasty and the gravy added a richness that I must admit captured the beef tangine I had in Morocco many years ago. The apples and raisins in the dish allowed for a natural sweetness to the gravy to lessen any acidity in the recipe. 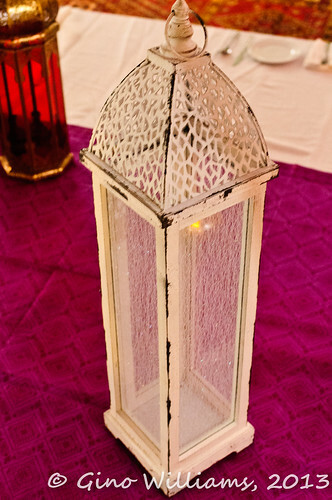 The table that initially was a burst of conversation was accented with quiet. Now, there was not going to be meat only, so there was fennel served with the beef tangine. Whenever I have had fennel, it has been in salads and such that any flavouring it could offer would be faint. I do not like licorice, Sam I Am, I do not like it. However, fennel served without anything else being in the way of flavour has a distant licorice highlight to it. I love fennel. How can this be? It’s as bad as me hating peanuts while having an addiction to peanut butter cookies at the same time. Yes, I am an enigma, one who appreciates a plate of smile-inducing fennel. Once the course of beef tangine and fennel was cleared, we had an intermiso of pomegranate juice with rose-water and mint. Aside from the rose-water being added, the drink reminded me of hibiscus tea or kakade that I loved during my trips to Alexandria, Egypt. Rose water seems to be a common addition to some beverages and desserts in the Mediterranean, so I can only imagine there being an influence in Moroccan recipes. As soon as I find some market in the Chicago metropolitan area that sells rose-water, I will prepare my own concoctions of liquid happiness. The second intermiso was a glass of fresh squeezed orange juice with rose blossom water, served in a glass with cinnamon and sugar around the rim. If this isn’t a summer drink, I cannot tell you what is. 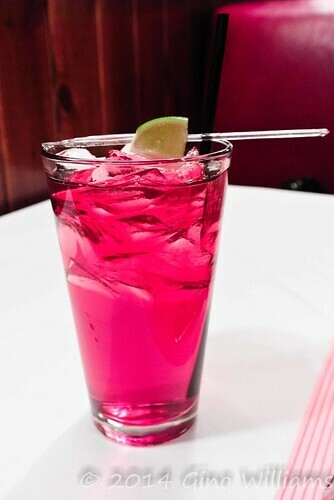 I am adding rose blossom water to my list of ingredients for my summer beverages. We waited for well over fifteen minutes before the next course came to the table. This allowed for bellies to settle without being inundated with more tasty food immediately. Conversation was lively, new names were introduced that I won’t recall but whose faces I will remember, and anticipation was full in the air. 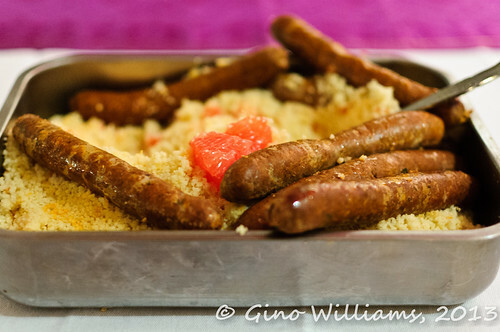 Then came merguez and couscous. I had given in with the previous course and indulged the beef, so I forewent the merguez. Those who were seated near me raved about how they loved the chicken and lamb sausage. It definitely sounded like a winner and their facial expressions indicated so in the affirmative. I did enjoy the couscous, which had a citrus flavouring to it. What I loved most about the couscous was that it wasn’t of the consistency of mushy rice or sticky grits. I was reminded of cornbread dressing without the soupiness of it sitting in broth. Had I partaken of some merguez, I bet the dish would have been several notches past the 10 that I had already given it. After the finale of merguez and couscous, there were desserts and traditional mint tea. The chef for the evening was honest enough to inform us all that the desserts were catered courtesy a bakery named M Desserts. Anyone who has had any desserts from the Middle East, you know that there is a high level of intricacy to the design and baking process. You cannot whip up some batter, put it on baking sheets, bake for some length of time at some set temperature, and serve as if you were some master baker. There is a science to desserts from the North African/Middle Eastern/Mediterranean part of the world. I shall have to find M Bakery. Nevertheless, there was an array of pastries, and cookies, all sweet and full of nuts the way they are prepared and served in Morocco. 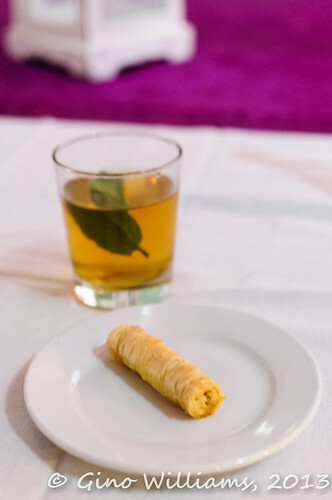 And we could not have any of those desserts without some mint tea served traditionally in a glass, from which you have to use the tips of your fingers to hold the glass by the rim and sip. Most of the guests were personal friends of the guest chef. They described him as being great as a butcher. Although I have never been to the shop where he works, I would venture to say that his chef talents probably put his chop-chop skills to shame. It is unfair for me to say that what I had transported me back to my visits to Morocco, but I will say that the food would be worthy of return visits to any restaurant where he was the master chef. I hope that his volunteer chef work for the evening will help towards raising awareness about the Hairpin Arts Centre. Considering I have lived in Logan Square for years and have passed the building where the arts centre resides, the absence of a moniker or any advertisements have resulted in me constantly passing by a significant part of the Logan Square landscape. I would hope to see more coming out of and going into the Hairpin Arts Centre, and I would gladly support Christopher Turner if he were to take his talents up a notch along the lines of culinary arts. When you have gone to India and eaten at any restaurant, home, or down some alley, the standard for preparation of Indian food is pretty much ingrained. You might not know the exact amount of herbs and spices that each dish should have, but you know when the food is so good that talking to someone while you are eating is the last thing you want to do. And when you hear people say that cab drivers frequent a certain Indian eatery, you think authenticity. You get slightly hyper, ready to gnash away at something spicy, hungry like the wolf. 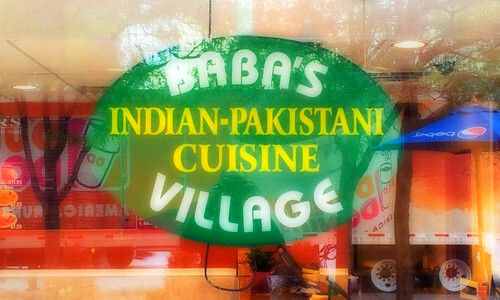 Last year my colleagues took me to a nearby Indian hole-in-the-wall at 310A S. Canal Street named Baba’s Village. As far as quick goes, it fits the bill. At the time, there was a constant ebb and tide of suits, ties, and wanderers off some Amtrak train from the neighbouring Union Station. It looked like it had all the trappings of the Indian spots that have endeared themselves to my appetite. And without extra charge, you got a bit of attitude with your order. I never bothered to return because the personnel atmosphere had ruined the meal, which was so Americanized that it was practically American food being passed off as Indian food. I returned recently after work when there was no crowd and noticed a change. Granted the Indian guy at the cash registered barely looked at me while I was placing my order, that changed with a little bit of Hindi that I let sprang forth. I have a habit of unconsciously letting people know that I’m not as typical as I look. So, he was rather engaging thereafter, and it may have been the few short sentences of Hindi that resulted in my food being – and I must apologize for the blatant continuation of my sentence – so DAMN DELICIOUS. The samosa was spicy and almost the size of a fist. Considering my hands are extra large, I will say that the samosa was about the size of a large fist. It came hot and flaky, not cold or lukewarm and chewy. That was a big change from what I remember during the lunch order I had last year, in which the samosa had the texture of toast. Where there was indeed a HUGE improvement was with the chana bhatura. 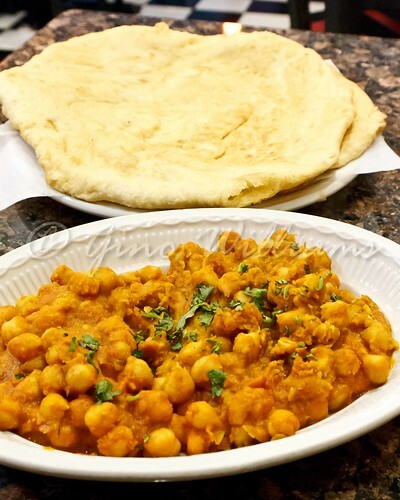 I am a fan of choley and bhatura. 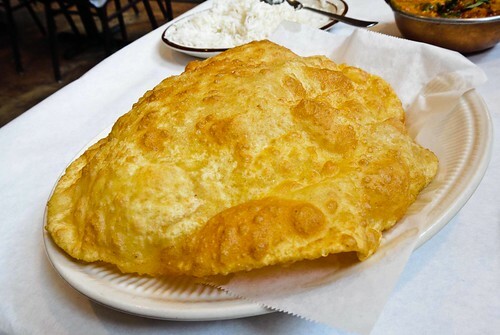 The bhatura was certainly not a let-down. The chana was still very much like seasoned chickpeas in a spicy stew gravy, but there was flavour this time. I have no idea what the concoction was that I had last year, but its bland-as-a-rice-cake flavour then was nothing like the pop that I had during this recent visit. I actually finished everything and when I say everything I mean I took the last pieces of bhatura and went around the bowl to sop the last bit of gravy. It may have been my appetite. It may have been that the cook had more time to prepare dishes without the rush of the lunch crowd. Whatever it was, this most recent visit was an indication that Baba’s Village may be worth avoiding during noon and waiting until after 5:00 PM when everyone is rushing home or to some watering hole to turn up some beers. The prices aren’t all that expensive. I can’t speak to any dishes other than the chana bhatura and the sampling of some “You call that tender?” butter chicken that a fellow colleague had last year. I wouldn’t be surprised if the butter chicken doesn’t have a wow factor after 5:00 PM. I can’t say. But maybe during your visit, you can let me know thereafter. I have been on a serious Italian kick as of late, so a friend had recommended a certain Italian grocery store/restaurant in Cicero, Illinois. Since it is not on any main road where there is a long list of eateries from which to choose, it was one of those holes in the wall that I had missed whenever I passed down the road where it is located. I figured I would try it out since it was a small family owned place and you certainly get some of the best food from those kinds of establishments. After constant prefaces of the place not being chic-chic, it was apparent that after five years of knowing me, my friend doesn’t realize that Caribbean stock care far less about how a restaurant looks because we are strictly about whether the food warrants an applause. Ready? Set? And off we went to Freddy’s at 1600 S. 61St Avenue in Cicero. On entry, you walk into a grocery store where you can purchase your share of Italian products for all of your Italian recipes. Then you approach the counter where you are greeted with cooked meats, pastas, antipastas, salads, and a very inviting staff. One thing that was noticeable was that there is apparently a constant set of regular customers who come in. That becomes evident when everyone at Freddy’s would greet certain customers by first name or simply start dishing up food without the customers having to say what it was they wanted. Despite the long lines — and believe me when I say that they get to be long — those who are behind the counter don’t rush you, as they answer all questions you have about what they have on their display. We of Caribbean makeup are accustomed to that kind of service. The homemade cheese ravioli with vodka sauce was the light to my fuse. 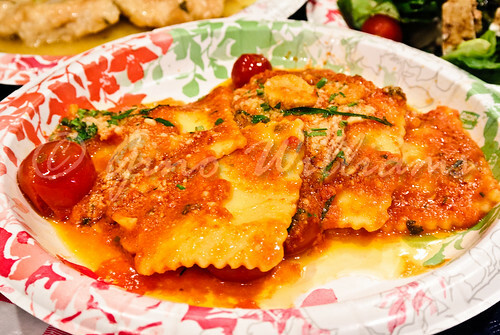 It took me years to start indulging ravioli because having eaten Chef Boy-Ardee ravioli as a child, there was something in my early adult life that had told me ravioli was a work of the devil. 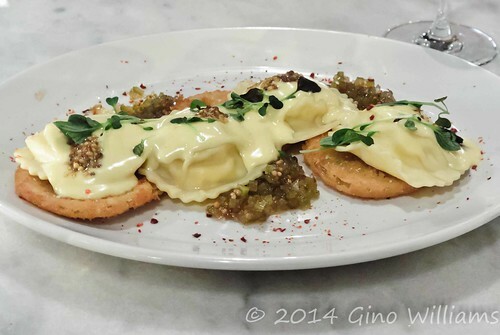 After years of living in Chicago and divining myself on some real Italian food, ravioli had worked itself in to my diet. The cheese ravioli at Freddy’s was a prime example of why I love the menu item so much. 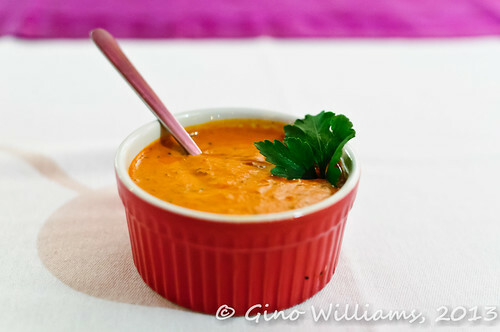 The vodka sauce was neither bland, nor salty, nor acrid. Thinking that the substantial amount of ravioli piled up on the plate would feed into a noticeable cha-ching once things were rung up at the register, I was rather shocked to discovered that the price was way less than what I had expected. Full of flavour but not with a high charge accordingly, I was way past happy. 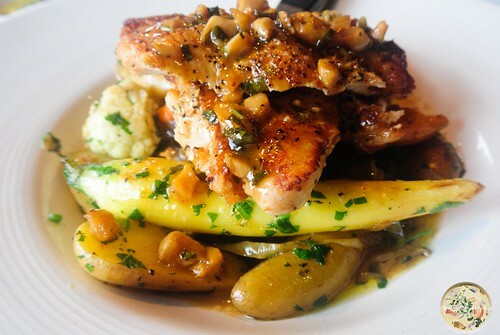 We went a notch up with a plate of chicken piccata. I like fish in a lemon base, but not my chicken per se. This dish changed it all. 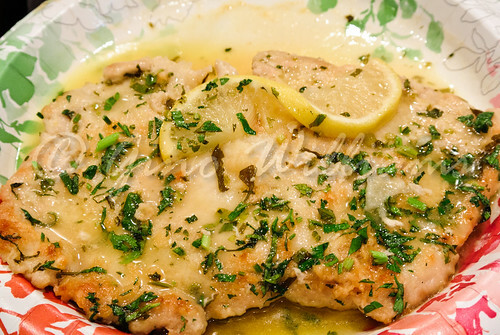 I think part of the problem with chicken piccata I have had in the past was that it seemed the chicken was cooked in pure lemon juice without any other herbs and spices. I was expecting to have my eyes scrunched and the bite of lemon nipping at the back of my jaw. That was not the case. The basil, the sauce, and bloom in each bite, I requested another loaf of bread and used it to sop the sauce. There was no reason to sit around like a charm school student when such a tender piece of chicken was as appetizing as it was. 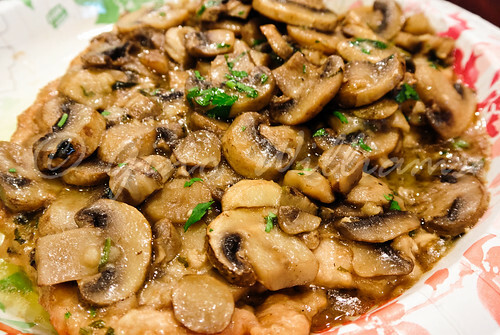 Defeat was nearing but not absolute, for we dealt a wonderful blow to the plate of chicken masala that was buried under fresh, plump mushrooms. I don’t know how they prepare the chicken at Freddy’s but it is ridiculously juicy and so tender you could liken slicing it to cutting a cloud. Again, I got more bread so that I could go around the plate to sop up the worthy gravy. If you go to Freddy’s, I highly recommend finding out when they open. GO THEN. They are incredibly good at the service and the food that they prepare. The wait is worth it, but you may want to start indulging immediately rather than wait. Freddy’s has a cash-only policy, so keep that in mind. I did not get to survey the full lay of the small grocery store to see what all they had on their shelves. 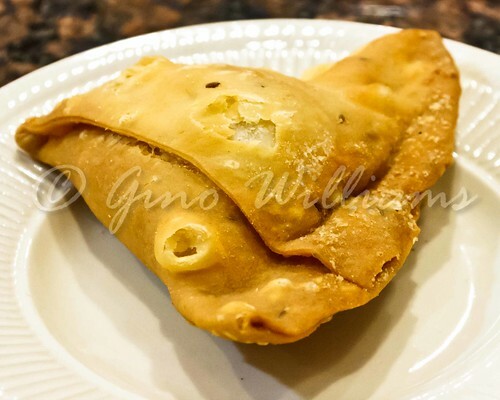 Much like a lot of small ethnic grocery stores, the products are of a quality to make your recipes pop more than they would if you were to buy the same products from a big box grocery store. If I could force myself to get out of bed earlier on Saturdays, I would rush down to Cicero so that I am at Freddy’s when the door opens. At some point I will and I will lick my fingers like we Caribbean people do when we feast on food that we like.